MOSCOW, December 9 (RIA Novosti) – The Kremlin announced Monday the dissolution of RIA Novosti, the country’s major state-run news agency, amid a significant reorganization of state-owned media assets. News agency RIA Novosti and the state-owned Voice of Russia radio will be scrapped and absorbed into a new media conglomerate called Rossiya Segodnya, according to a decree signed by President Vladimir Putin. The move is the latest in a series of shifts in Russia’s news landscape, which appear to point toward a tightening of state control in the already heavily regulated media sector. In a separate decree published Monday, the Kremlin appointed Dmitry Kiselyov, a prominent Russian television presenter and media manager recently embroiled in a scandal over anti-gay remarks, to head Rossiya Segodnya. Head of the presidential administration Sergei Ivanov said the changes were about saving money and making state media more effective. “Russia has its own independent politics and strongly defends its national interests: it’s difficult to explain this to the world but we can do this, and we must do this,” Ivanov told reporters. The direct translation of Rossiya Segodnya is Russia Today, but the new body will apparently be separate from RT, the Kremlin-funded English-language television channel originally known as Russia Today. RT head Margarita Simonyan told Russian news website Lenta.ru on Monday that she only found out about the decree from news reports. The changes, including legislative amendments, must be carried out by the government within three months, according to the Kremlin. 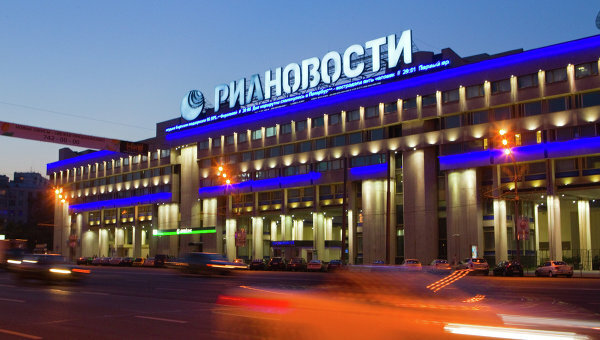 Rossiya Segodnya will be located in the current RIA Novosti building in downtown Moscow, the decree said. RIA Novosti was set up in 1941, two days after Nazi Germany invaded the Soviet Union, as the Soviet Information Bureau, and now has reporters in over 45 countries providing news in 14 languages. Last month Gazprom-Media, which is closely linked to state-run gas giant Gazprom, bought control of Russian media company Profmedia from Russian billionaire Vladimir Potanin. In October, Mikhail Lesin, a former Kremlin advisor, was appointed to head Gazprom-Media.